But since some use the film as a starting point, I decided to write this update. Notably, the landscape in and around Downtown Brooklyn has changed dramatically since 2011, with many new towers to the northwest of the Atlantic Yards/Pacific Park project site, making the scale of the proposed project less anomalous, at least from one angle, though less so from other angles. Only four Atlantic Yards/Pacific Park towers have risen--with four more starting this year and next. Meanwhile, gentrification has proceeded both in the immediate area of Prospect Heights and not far away. Part of that reflects general trends in New York City and Brooklyn. That means that, despite the fact that much of the Atlantic Yards/Pacific Park "affordable housing" is not that affordable (and some units have come with rent concessions), it looks better in contrast with a large majority of the Downtown Brooklyn towers. It's fair to say the "Battle for Brooklyn" title now seems a bit overblown. But it was Brooklyn's biggest battle in recent memory. There have been--and will be--other battles in Brooklyn, which is a changing organism. But this one has left something of a template for developers who propose ambitious plans and promise desperately needed benefits. Well, maybe people won't remember how long the arena took, but the sluggish pace of construction certainly serves as a reminder that Atlantic Yards/Pacific Park hasn't panned out as promised, especially since the project is now expected to take until 2035, even if the 2,250 affordable units might be finished by 2025. That said, a supporter like former Deputy Mayor Dan Doctoroff, surveying the overall changes in and around Downtown Brooklyn and (dubiously) crediting Forest City Ratner significantly, wrote that the developer's "vision, commitment, and tenacity made the transformative project possible." And while famous architect Frank Gehry was gone, the arena, in many architecture critics' eyes, was indeed rescued by SHoP Architects' revamp of the Ellerbe Becket design derided as a "hangar." Is the arena today a "hollow accomplishment"? Now that it's been open, it's helped rebrand Brooklyn, for better and for worse, and provided a venue for sports and events previously unavailable, while also symbolizing unfulfilled promises and vexing its nearest neighbors. It's, at best, a very mixed accomplishment. Was it a fair fight? No, and it's never been so. 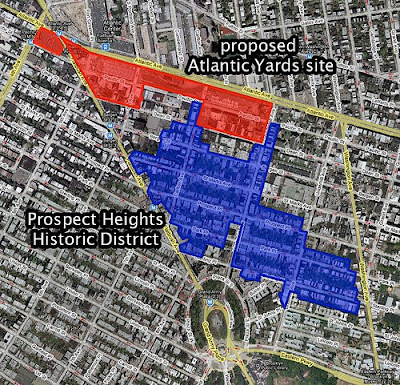 It's no small irony that, in the passage of time, one notably critical voice regarding the unfairness of that fight came from Arana Hankin, who was Atlantic Yards project manager for Empire State Development, the state authority charged with the contradictory responsibility of both shepherding and overseeing the project. Develop Don’t Destroy Brooklyn, the project's leading opposition group, is essentially defunct, and Daniel Goldstein, the film's main protagonist, has left public life; the project “opposition” today is more neighborhood residents who are understandably concerned about the impact of arena operations and project construction. Council Member Letitia James rose to Public Advocate, showing distance from Atlantic Yards but, when running successfully for Attorney General, embracing her role in the fight, even too much. Most of the Community Benefits Agreement signatories are defunct or inactive; the single clearly active one is the Rev. Herbert Daughtry’s Downtown Brooklyn Neighborhood Alliance, which distributes free tickets to arena events, to nonprofit groups. Daughtry also helps run a foundation partly funded by the project/Nets. BUILD (Brooklyn United for Innovative Local Development) was sued by those in a coveted pre-apprenticeship training program, who charged they were promised construction jobs; that case was eventually settled, murkily. But it's clear the promised jobs, like the promised housing and the promised MWBE (minority- and women's business enterprises) contracting, fell short. The Community Benefits Agreement, claimed to guarantee such benefits, is essentially unenforceable, as no promised Independent Compliance Monitor has been hired, and the signatories, the only parties with standing to challenge it, have not pushed. The AY CDC, despite a few members' questions and some steps toward transparency, has been mostly toothless, with one 2018 meeting scheduled with minimal notice, seemingly to enable an endorsement of a contract renewal. At a March 2019 meeting, an effort to request an updated project timetable was actually voted down. The Barclays Center didn't cause the "carmageddon" many feared, producing "told you so" crowing from some prominent arena backers. But the fears were based on published warnings in the state environmental review. The worst-case scenario didn't come true, for several reasons: the arena was decoupled from the four towers originally planned to open simultaneously, the smaller-than-planned building drew fewer attendees, Nets fans mostly use public transit (and walk), and New Jersey fans of the Nets dropped off rather than drive to Brooklyn, while a new fan base began to emerge. For the most part, people think the arena's green roof was installed as a visual amenity, rather than as a (effective, it seems) way to dampen bass that was somehow escaping from the arena's structure. Interestingly enough, there's still empty retail space on the Flatbush Avenue flank of the arena, prompting the introduction of a "Featured on Flatbush"pop-up. Also, two years after the opening of 461 Dean adjacent to the arena, the retail space is still unfilled. Meanwhile, the amount of arena-related retail on nearby commercial corridors is less than feared/expected, though several bars and eateries have emerged. Oddly, one of the most prominent spaces, the former Triangle Sports building directly across from the arena on Fifth Avenue, remains empty. More generally, retail nearby has become upscale, catering to new residents. 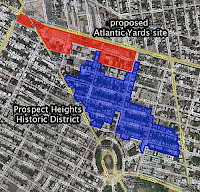 Even before the film emerged, the Prospect Heights Historic District was approved in 2009, nudging up against the Atlantic Yards/Pacific Park site. See above right. 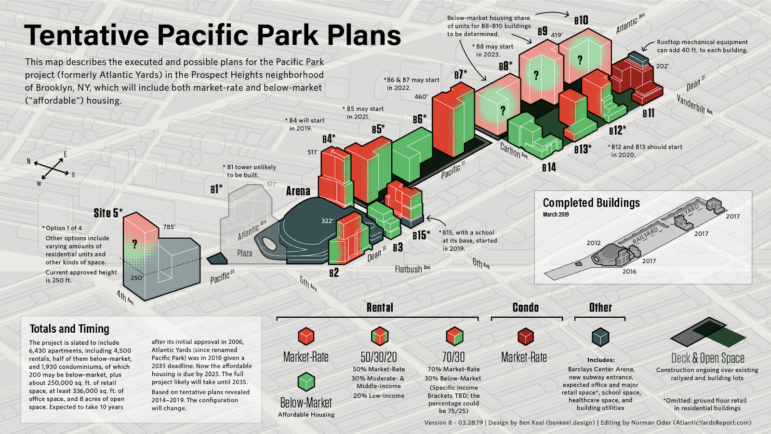 The promised eight acres of open space--the privately operated, publicly accessible "Pacific Park"--won't be finished until the full project is finished, perhaps not until 2035. Meanwhile, the fractional open space around two towers has opened, but basically serves building residents. It relies significantly on the completion of three towers over the railyard at the eastern end of the project. After three years struggling at Barclays, they began splitting their seasons in Brooklyn and at the revamped but downsized Nassau Coliseum, considered too small for the NHL as a permanent home (and without luxury suites). While neither company did well on the arena, it has caused a significant increase in the value of the Nets, bringing a big check for Prokhorov, who sold to another billionaire, Joe Tsai. Now Tsai is said to be preparing to buy the operating companies for both Barclays and the Coliseum, perhaps ending Prokhorov's plan to become a venue mogul. That, in turn, ultimately led to the complete demise of Forest City Realty Trust, which, after a close board vote in 2018, agreed to be absorbed by Brookfield Asset Management after shareholders ratified it. In late 2018, Greenland--part of a pattern of retreating from ambitious plans in New York and in Los Angeles--announced that it would lease three development sites to other companies: B15 to The Brodsky Organization, and B12 and B13 to TF Cornerstone. Chinese companies face increasing governmental restraint on debt and outbound capital flows. Now, after three rounds of fundraising for the project, there's widespread skepticism toward the program, which--given the questionable marketing already evident in 2010, when I first wrote about EB-5--is long overdue. Now there are even charges of fraud, though it's unlikely they'll be evaluated in a New York court, given a plan for arbitration. No Atlantic Yards/Pacific Park building started between mid-2015 and February 2019, which meant the promised school--in that finally-starting tower, B15--has been delayed at least four years, until 2022. (Also, the B4 tower should start very soon.) The open space--the eight-acre "park"--won't be finished until the entire project is finished. That was once projected as 2025: they'd finish the affordable units in the final buildings. That was finally acknowledged as 2035, as of May 2018 (and disclosed by me in August 2018). Greenland has played its cards close to the vest; the plan to finish affordable units by 2025 apparently relies on building another "100% affordable" building, I discovered, thanks to an appraisal document circulated to EB-5 investors. 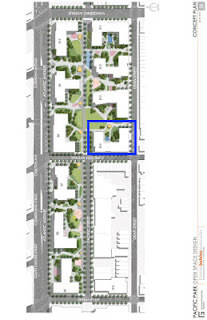 Instead, the joint venture wants to move the bulk of B1--no one throws away buildable square footage--across the street catercorner to Site 5, home today to the big-box stores P.C. Richard and Modell's, and already slated for a large tower. A far larger two-tower complex might be built, though the governmental process hasn't started, in part because P.C. Richard in court sought--and won--a ruling to ensure space in a replacement building. Stay tuned--more changes, and surprises, are inevitable, especially regarding the timetable, affordability, and ownership. As I recently explained, up to six years are needed just to build the infrastructure--the foundations, deck, and more--to support six towers over the Vanderbilt Yard, with costs exceeding $200 million. That's a heavy lift, with many unknowns. Atlantic Yards/Pacific Park may not be a "Battle for Brooklyn" any more, but it is an unending saga, with the question marks emerging in new ways. Unsurprisingly, the basic dynamic regarding the projects remains consistent; neither the city nor the state do much to challenge the developer. The Brooklyn Nets, after some lean years, have regrouped and this year made the playoffs. The Barclays Center remains major venue and place to hold charitable events; public officials like Borough President Eric Adams and Rep. Hakeem Jeffries honored hip-hop artist Biggie Smalls in promos for expensive Nets jerseys. Developer Bruce Ratner is now better known for his role leading the Museum of Jewish Heritage. The taint persists. Amazon, in its search for #HQ2, passed on Atlantic Yards/Pacific Park sites. Post columnist Steve Cuozzo recently wrote that the glitzy Hudson Yards "mocks" the Brooklyn project. New York Magazine's Justin Davidson, writing on potential development at Sunnyside Yard, suggested that the "perpetually troubled" Atlantic Yards/Pacific Park "offers another case study in what to avoid." Atlantic Yards/Pacific Park may be vexed, but no one's really responsible.